There's an epidemic sweeping the nation Symptoms include: *Acute embarrassment at the mere notion of 'making a fuss' *Extreme awkwardness when faced with any social greeting beyond a brisk handshake *An unhealthy preoccupation with meteorology Doctors have also reported several cases of unnecessary apologising, an obsessive interest in correct queuing etiquette and dramatic sighing in the presence of loud teenagers on public transport. If you have experienced any of these symptoms, you may be suffering from VERY BRITISH PROBLEMS. VERY BRITISH PROBLEMS are highly contagious. There is no known cure. 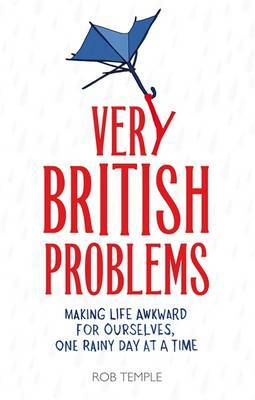 Rob Temple's hilarious new book reveals all the ways in which we are a nation of socially awkward but well-meaning oddballs, struggling to make it through every day without apologising to an inanimate object. Take comfort in misfortunes of others. You are not alone. Reading through this I realize I do a majority of these things without realizing! "Patiently queuing in a queue that turns out not to be a queue at all".